College students think that digital learning technology is helpful across a wide variety of activities, including doing homework, preparing for exams, and doing research, according to a new report from McGraw-Hill Education. For the report, McGraw-Hill Education collected data from 2,780 McGraw-Hill Education customers and 531 online panel respondents. To qualify for the survey, all respondents had to be current students at the graduate, bachelor’s, or associate’s level. While smartphones and tablets are becoming increasingly popular, students still rely on laptops for most of their studying needs, and consider laptops to be the most study important resource. However, mobile devices are still important. 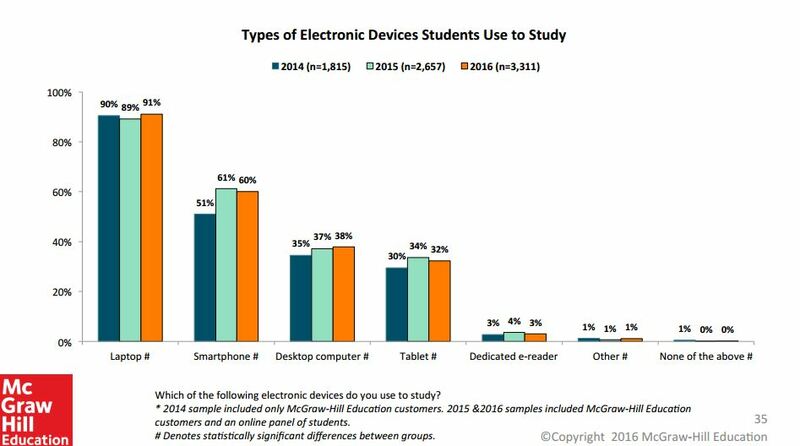 More than one-fifth of respondents find the ability to study on mobile devices “extremely important,” and mobility continues to be respondents’ favorite aspect of digital learning technology, the report explains. However, integration remains a concern for students. 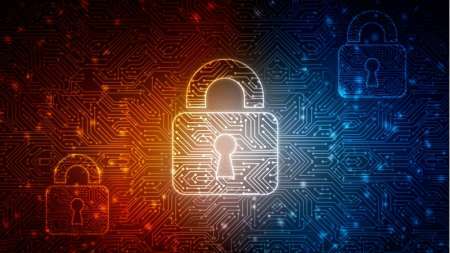 Forty-five percent of respondents said that digital learning technology integration with personal devices is a problem they experience. Eighty-four percent of students believe there are additional areas where technology could be used to enhance their education. While 80 percent of college students say digital learning technology has had a positive impact on their grades, only 39 percent would purchase non-required digital learning technology for a class. The report notes that ultimately the understood grade improving and time-saving benefits of digital study technology may not convince cost-conscious students to voluntarily adopt a product. 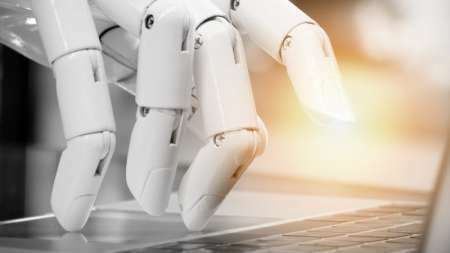 Improving adaptive features (considered important to many respondents) and costs (the factor most likely to encourage increased use) may help increase digital learning technology adoption rates, the report notes. 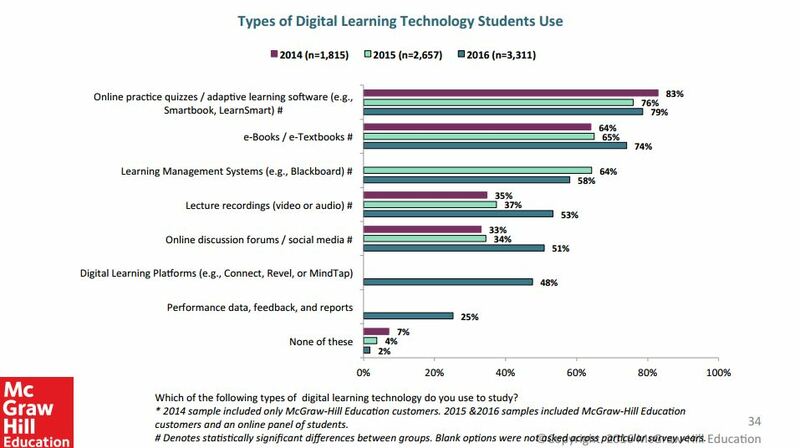 McGraw-Hill Education also examined what types of digital learning technology students like to use. 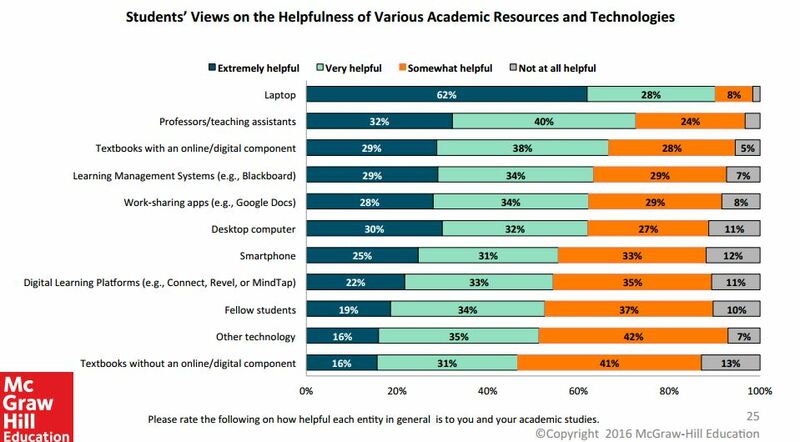 Unsurprisingly, technologies that would directly help students improve their grades were the most popular. Additionally, over the past three years, social media has becoming much more popular among students. Technology is often viewed as a way to increase efficiency, so McGraw-Hill Education asked what impact digital learning technology has on the amount of time students spend studying. 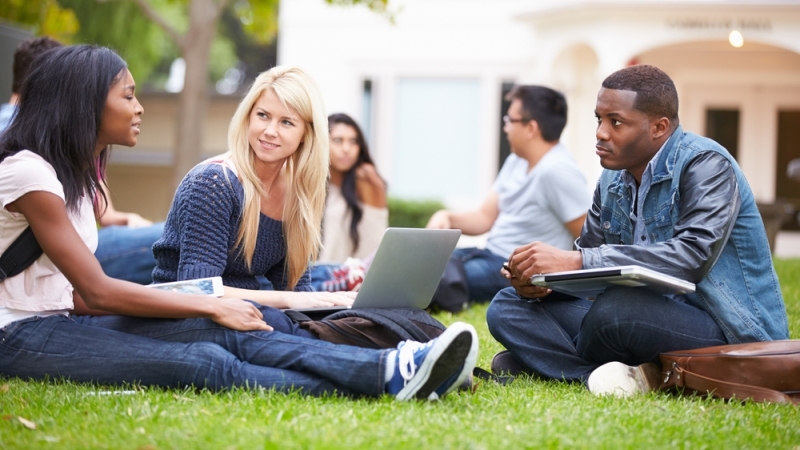 More than half of college students believe that technology helps save them time when studying. 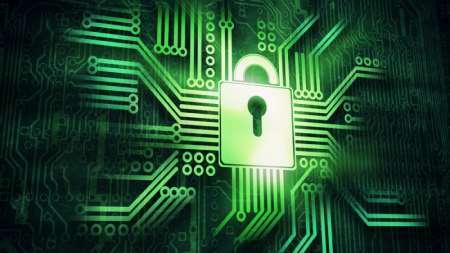 Additionally, for those who believe technology saves them time, most report that it saves a moderate amount of time.